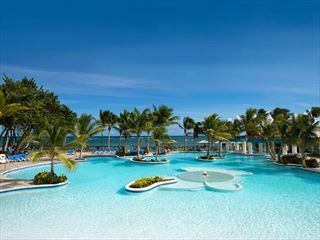 Since St James’s Club Morgan Bay became a part of the Elite Island Resort portfolio & there have been some big changes. We loved it before, but the recently-completed multi-million pound upgrades have improved it from a great beachside resort into something truly magical. 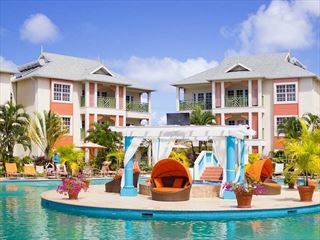 The resort is perfect for families and couples who want to lose themselves in the glow of the St Lucian sunshine. Taking children is no problem thanks to the Kids Club. 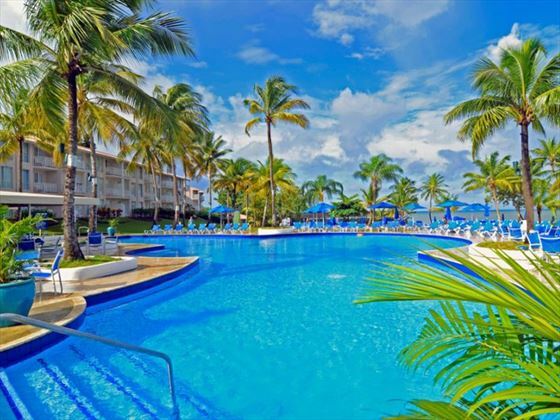 It’s part of the all-inclusive package and means that you get some free time away from the children while they get to enjoy themselves with fun activities and playgrounds too. Walk on the sun-drenched beach, dine in style or rest poolside – your experience will be defined by two words: serene and content. 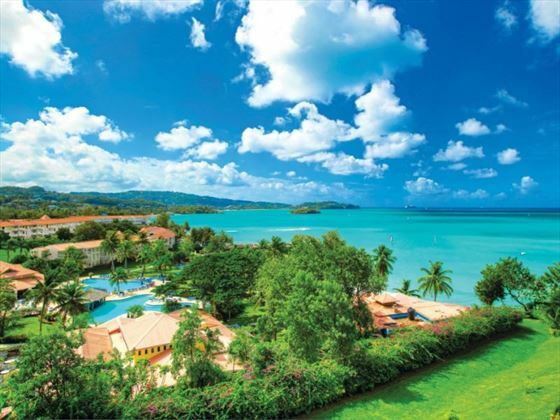 We love the way the Caribbean colours come alive here; turquoise waves lap at a golden beach surrounded by lush greenery. This isn’t the kind of place where the hotel tries to entertain you – there’s no need. 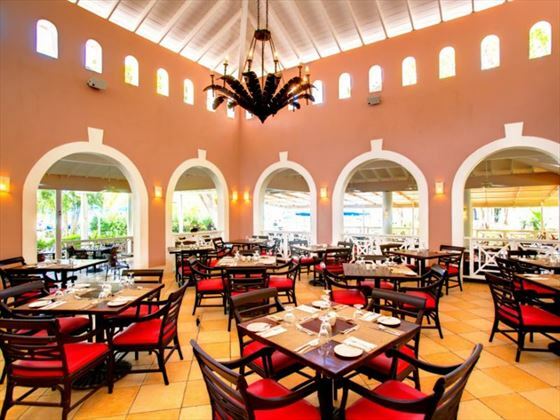 The resort offers four restaurants, so you can either dine casual or gourmet depending on where your mood takes you. 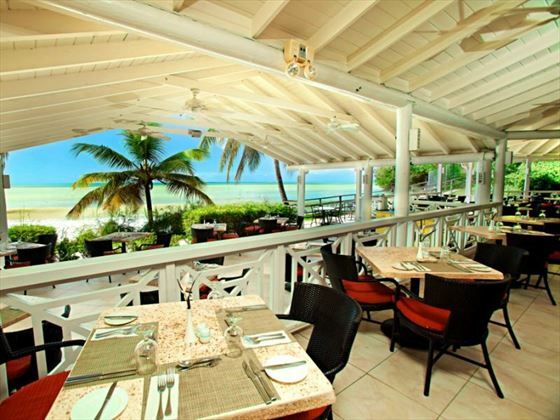 There are also five bars serving a delectable selection of Caribbean cocktails. The friendly and attentive team ensure that your experience never feels like anything other than a pleasure. Top Tip: Ask about the Spa Suite – you’ll receive incredible ocean views and a free spa treatment for every day you stay, excluding your arrival and departure days. 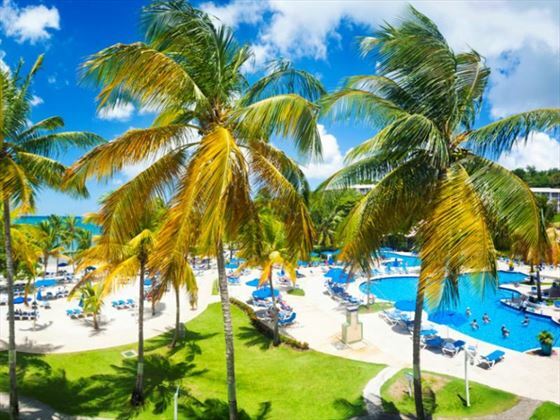 Further reading: St James's Club Morgan Bay is featured in our guide to the top 10 honeymoon hotels in St Lucia. Garden View – Caribbean-themed rooms with a king-size bed. Each rooms features views of the tropical gardens. Max occupancy three, with third person on a rollaway bed. Twin beds are not available in this room type. 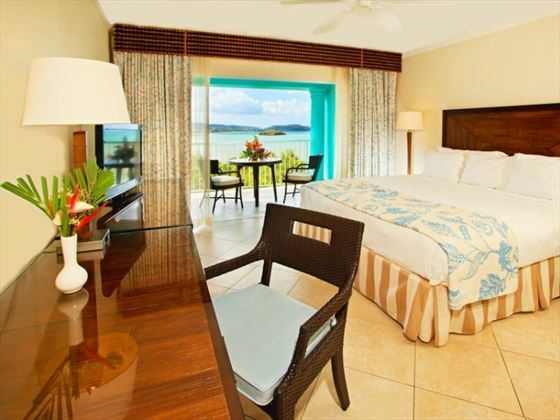 Ocean View – Spacious room featuring full or partial ocean views and a king-size bed. Max occupancy three, with third person on a rollaway bed. Twin beds are not available in this room type. Premium Double - Spacious room featuring full or partial ocean views and two double beds. Max occupancy four people. 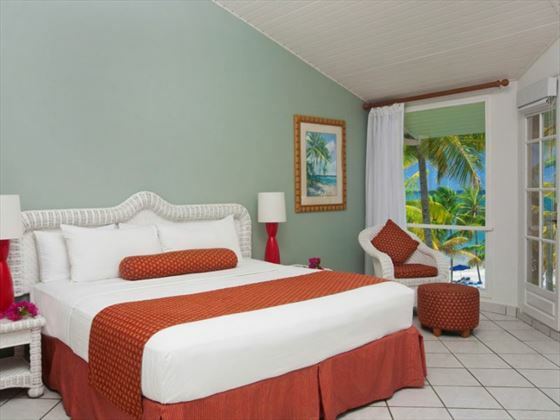 Beachfront – Situated close to the beach with a king-size bed and ocean views. Max occupancy three, with third person on a rollaway bed. Twin beds are not available in this room type. 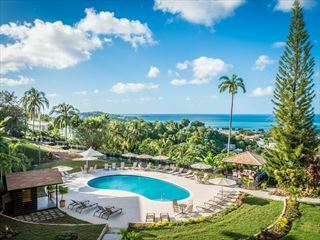 Deluxe Ocean View – Popular hillside rooms with upgraded furniture, panoramic ocean views during the day and the romantic lights of Castries in the evening. Max occupancy two adults. One Bedroom Ocean View Suite– Spacious suites featuring large bedrooms, living area and bathroom with spacious Roman tub. Excellent views of the Caribbean Sea. Max occupancy four, with a 4ft wide sofa bed in the living area for the third and fourth person. Family Suite Garden View – Larger interconnecting suites perfect for families, with a twin double-bedded room. Max occupancy six people. One Bedroom Garden Spa Suite - These hillside suites consist of a spacious bedroom and adjoining living area, with the bathrooms featuring large Roman tubs. Balconies or patios span the entire width of the suite. Includes five daily spa treatments per seven-night stay. Max occupancy two people. 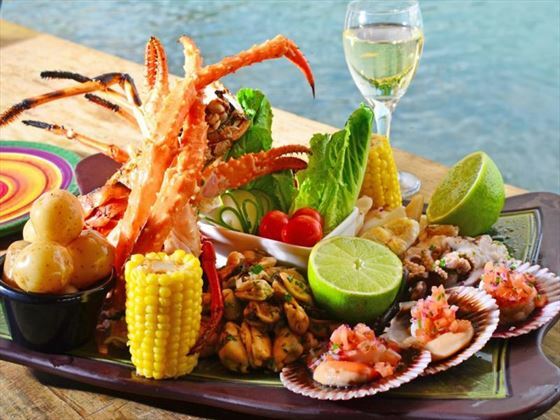 In the restaurants, shoes must be worn, bathing suits must be covered and men do not wear tank tops or sleeveless shirts. After 6.30pm men have to wear slacks and collared shirts and women wear dresses, slacks or culottes (no shorts or shorts outfits). You are required to produce a valid Wedding Certificate or copy at time of booking and check-in. Evening entertainment including discos, karaoke, dancing, live music and more! My favourite part of this hotel was the incredible seafood dinner I had at Morgan’s Pier Restaurant, it’s definitely worth booking for the food and the view! 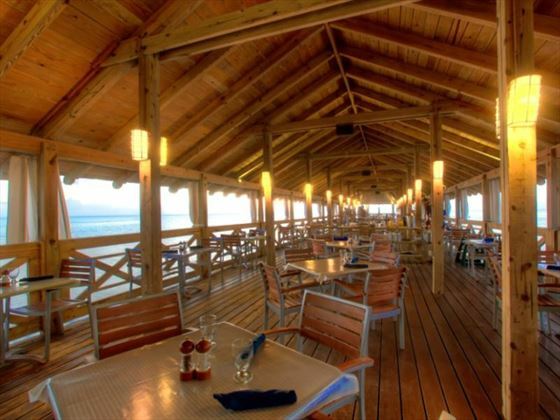 If you take a trip to Rodney Bay, Spinnakers offers excellent, well priced food right on the beach. 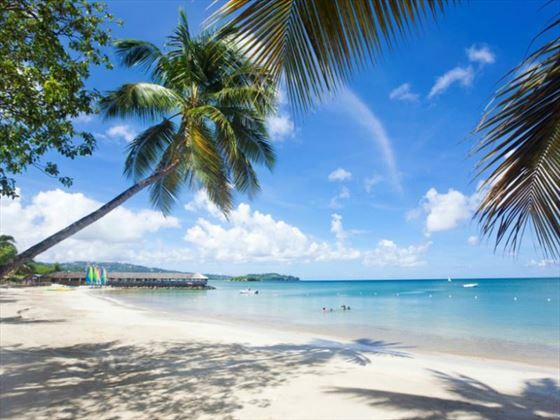 Bay Gardens Beach Resort & Spa is nestled in the stunning, secluded beaches of Saint Lucia. 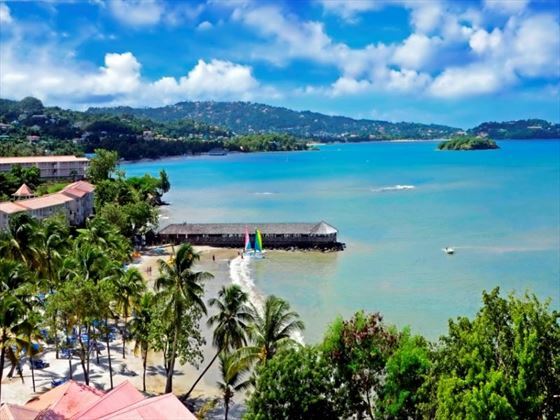 Warm sand, blue gleaming waters, exquisite dining and accommodations are the ideal backdrop for the perfect escape to Saint Lucia. There are a range of activities to choose from.